The Wall Street Journal just published a fascinating article about Foundation Partners Group, which owns funeral homes in 14 states. The CEO, Brad Rex, formerly ran Disney’s Epcot theme park, and has introduced “multisensory experience rooms” to all their funeral homes. What’s a multisensory experience room? 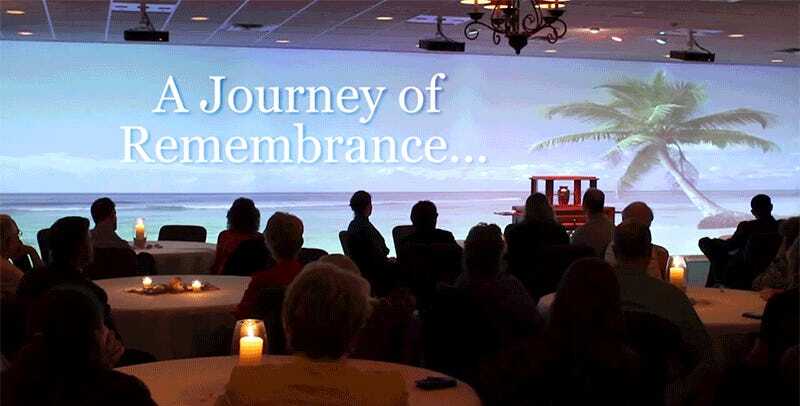 It’s a “life-size” projection screen where mourners can choose from stock video of different locations such as a beach or a waterfall. The presentation includes audio, and perhaps most notably, scents. Disney is well known for the element of scent in their theme park attractions, which makes their inclusion a no-brainer when you consider that Rex oversaw the introduction of rides like Soarin’ to Epcot. You can even order a web livestream of the funeral so that people who can’t attend in person can watch at home. The entire thing can also be recorded as a DVD keepsake. All of the high-tech add-ons are a direct response to more and more Americans choosing to get cremated. Roughly half of Americans who died last year were cremated, compared with just 10 percent in 1980. This is a huge problem for the funeral industry, which used to depend on expensive caskets and elaborate public showings for the bulk of their revenue.